Midway through DPT school, I had the opportunity to try the Skechers GOrun 4 (not 2016). At that time I had been reviewing shoes for a little over a year, was tutoring lower extremity mechanics for the 1st year DPT students and was just beginning to realize how much I loved neutral performance shoes. I knew enough at the time about foot mechanics to start really evaluating how a shoe should fit with my foot. I also still had a stigma about Skechers shoes, although a few runs in a pair of original GOrun Rides in late College had been fine. Upon receiving my pair pair of GOruns, I was immediately impressed by how sharp they looked and felt. 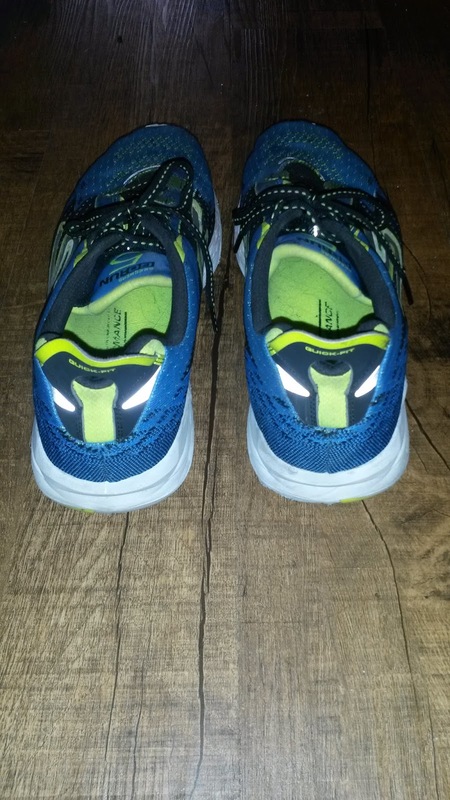 I was unbelievably impressed by the clear performance orientation that Skechers was taking. Money was tight at that time, so I was not able to keep them, but after placing well in a race that gave out free Skechers shoes as prizes, this allowed me to keep a pair of the Skechers GORun 4 2016. And again, I was impressed by how sharp they looked, the firmness, the awesome GOknit upper and how fast they felt. This was not a cheap running brand. This was Skechers Performance. As fortune would have it, I was able to get an early pair of the Skechers GOrun 5. I was interested to see the direction they would take given my comments on how version 4 – 2016 was a bit too firm and ran about a ¼ size long (REVIEW), but was still a good lightweight trainer comparable to the Saucony Kinvara with a little less there. What did I find? A fast, softer, borderline racer that was drastically different from the previous version. So let's talk about this. The first change I noticed was how much softer the midsole was compared to the borderline hardness of the GOrun 4 2016. To be fair most of my training in the GOrun 4 2016 was done around 4:30-6:30 am in Southern California winter, which can get into the 30-40 degree temperature range (most people there don't know that because they are not up that early). Although not midwest cold, colder temperatures do tend to firm up midsole materials. Regardless, the ride was pretty firm. The GOrun 5 has a softer and bouncier ride, to the point that the first run I took them on ended up being a fairly fast fartlek (during which I was dropping into sub 5 minute pace range for 1-2 minutes at a time). 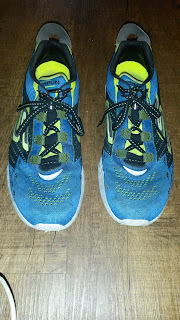 I do not tend to like softer shoes as I find them to be unstable (I have discussed how firmness affects stability many times on this blog. Firmer shoes are more stable, softer shoes are less stable). 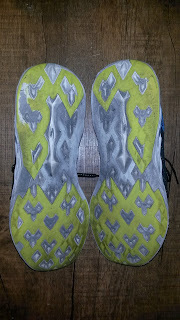 Somehow the softness of the GOrun 5 was not unstable, but seemed to give some rebound back. This may be due to retooling the durometer of the new 5Gen midsole, which I have very much enjoyed in the new GOmeb Razor as well (REVIEW). The cushioning in the the GOrun 5 is fairly consistent and soft, but due to the difference in drop (4-6mm), the heel is fairly soft while the forefoot is a bit firmer due to being slightly closer to the ground. This is fairly common in shoes closer to the ground, but in the GOrun 5 the slightly firmer forefoot definitely contributes to a faster ride. Being a shoe that weighs around 7.5 ounces, it did work for me as a lightweight trainer simply because I am used to more minimal shoes (given my history and previous foray into minimal and light shoes in college). However, I have found that this shoe also makes a fantastic workout and long distance racer. I have observed several Skechers Performance Elite runners use the GOrun 5 as a marathon racer and I would not hesitate to use it as such. 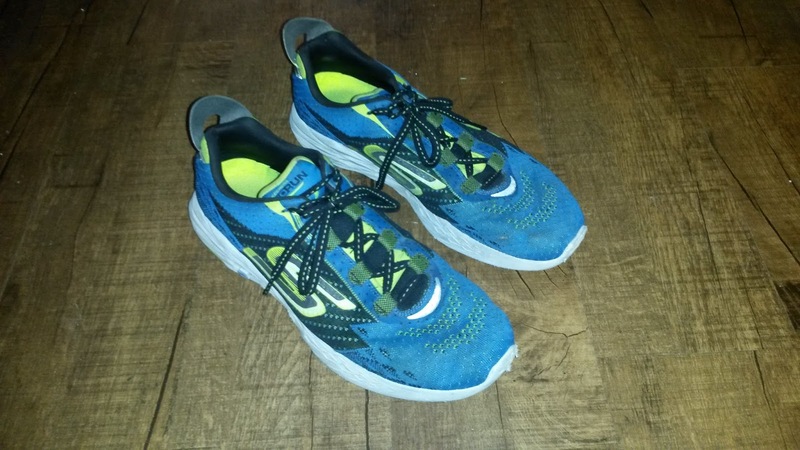 Whereas I tend to use the GOmeb Razor for easy runs, long runs and uptempo workouts (as the firmer midsole makes it more stable), the GOrun 5 begs me to go fast and this would be one of my first choices for the half to full marathon race distance. Despite being heavier, I would have a difficulty time making a choice between this and the Nike Streak 6. This shoe is light, the midsole has some pop to it yet is cushioned for the distance and as we will discuss later, the upper has more of a performance fit. Like the GOmeb Razor, the outsole and midsole of the GOrun 5 has been completely changed from the previous version. Gone is the podded outsole, the M-Strike midfoot bump and curved sole (although a heel curve is still present). The GOrun 5 now has a full ground contact, smooth outsole with a diagonal/diamond pattern similar to the Razor. The 4-6mm drop is still present and like the Razor, with the insoles in the shoe has more of a 6-8mm drop (which as always will be variable depending on your foot size and individual loading characteristics as that is not a static number). Compared to the Razor, the sole width of the GOrun 5 is narrower overall, which further gives this shoe a racer like feel. Durability wise the change to a full ground contact outsole with the addition of increased density material at the bottom has greatly improved the durability. My pair of GOrun 4 2016 outsole were quite shredded after 150-200 miles (although as mentioned before I am quite hard on shoes). Although there is quite a bit of wear on my pair of GOrun 5s after +200 miles (see below), they still feel ok and I expect to get at least 250-300 miles out of them, which is exactly what I would expect from a borderline racing shoe. While version 4 – 2016 fit a ¼ size long, the GOknit upper fit very well to the foot. It was what I had originally hoped the Nike Flyknit Trainer upper would feel like (but didn't. Current iterations of Nike Flyknit are now much improved). 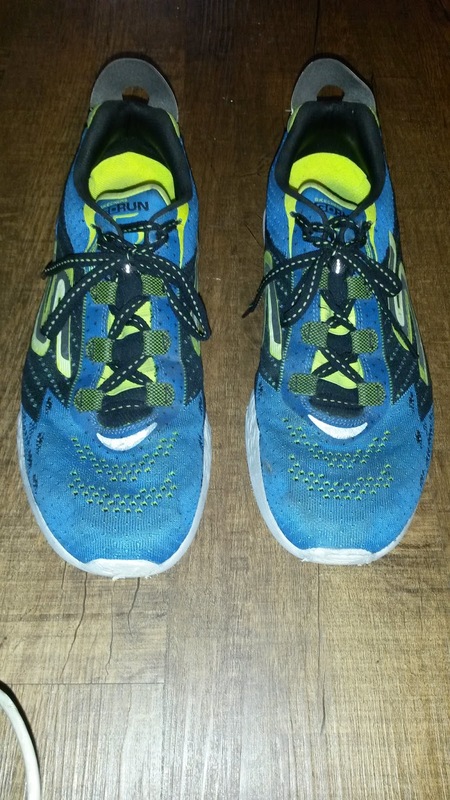 The GOrun 5 upper now fits very true to size, if not a tad small and narrower. At first I was concerned about this, but like all GOknit, the upper began to fit to my foot and would disappear within a quarter mile of all runs. The upper retains the GOknit, but while it is still a thin performance upper, the density of the wrap appears to be increased. If you like the high ventilation of the previous version, the GOrun 5 is now more normal in terms of airflow. That being said, this new density holds closer to the foot while still being much more flexible than the GOrun 4 – 2016 GOknit. The upper is very comfortable and snug, but the laces do not have quite as many eyelets, so to further snug down and secure the upper requires pulling them fairly tight. Luckily the upper already has a narrower racing like fit, so that hasn't been too much of a problem. For those with wider feet, the GOmeb Razor may be a better option and those with narrower to normal width feet should feel right at home. The heel is also narrower and holds the calcaneus fairly well, but midfoot forward seems to almost be too flexible. This is fine when running in a straight line, but very sharp turns can cause some mild foot sliding. 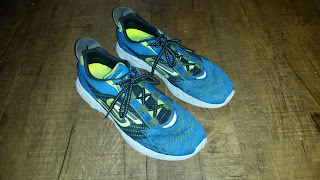 Despite using these shoes for mostly faster runs (including 13 miles at an average of 5:50-5:55 pace during a long run) I have not had any major problems with sliding as I tend to snug the laces down. Still one should be a little cautious on tight turns. Although the heel counter is very minor, the narrower heel does a great job of the holding the foot. There is a split achilles tab with a pull tag to help get the shoe on, which both fit very nicely around the heel and achilles tendon. 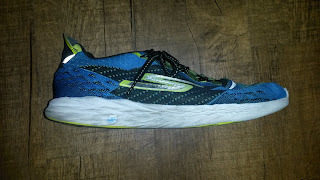 The GOrun 5 has one of the best heel fits I have experienced, as the use of GOknit in the back with the heel tab fit very well and disappear off the foot. This is another shoe I have used sockless and had zero issue with (although everyone is different and I cannot advise running sockless in any shoe unless your feet are used to it). The forefoot fit is narrower, but like all Skechers Performance shoes is more square and foot shaped than many of the competition (but not on Altra's level). I briefly felt some mild pressure on my 5th toe that disappeared as I broke in the upper. I again attribute this to the narrower performance fit of the upper. I tend not to be a fan of softer shoes. The GOrun 5 is one of the exceptions because the cushioning is not deadening but has rebound or responsiveness to it. By that I mean it feels like it actually springs and gives me some energy back, which is fairly consistent with the 5Gen midsole (which is not Boost like but is better than previous versions of EVA). I personally tend not to be a fan of softer shoes to to my own instabilities, which tend to be exacerbated by soft soles. As I have begun to better understand the body, the more hip strengthening I have done, the more neutral and even mildly cushioned shoes have not posed a problem for me. While my left ankle does have excessive mobility at the subtalar joint (where most eversion and a major portion of pronation comes from), the more I have strengthened and stabilized my hips, the more stable my ankle seems to feel. I do need to strengthen my posterior tibialis to have better control over my rate of pronation, by the hip muscles are so incredibly strong and there are so many of them that they provide a majority of the stability for the lower extremity. The huge glute muscles provide proximal stability and power, the adductors provide additional stability at both the hip and directly at the knee (as some do connect there) as well as contribute to a great deal of the speed to which the leg moves. What I took away from training in the GOrun, a generally softer shoe that I usually train in, is again what I have been taught for a long time. Before you go out there searching for the perfect shoe that exactly fits your mechanics, look at your mechanics first to ensure that you do not have some major deficit there. Surprise fact, you probably do. What I have learned from working with some incredibly fast runners is that while many of them suffer from the same issues everyone does, the best have incredible muscular strength AND balance. Every muscle is strong and is firing when and where it needs to be. A huge emphasis in the fitness world is put on the gluteal muscles as being the key to performance and injury prevention. With more experience (and I am just beginning my career as a Doctor of Physical Therapy), I have quickly begun to realize that we have most of our muscles for a reason and should focus on having all of them be strong and balanced between each other. I tend to see far more problems with muscle imbalance than with appropriate distribution of strength. The short version of this? Make sure your body is strong before you go look for that perfect shoe. Your body may not be working well with a certain shoe due to imbalances or weakness, so think a second before you blame the shoe (not that all shoes are designed well and will work with all bodies). Shoes help assist in you performance, but a strong and well trained body is what will make you truly faster. That being said I don't want to scare anyone away from trying many shoes given that I am a full fledged shoe geek and love seeing what is out there. This is not the minimally inspired cushioned shoe that Skechers originally came out with. The GOrun 5 is now definitely a performance/long distance cushioned racer that will work well for those looking to go fast during races, workouts or training runs. It is hard not to pick up the pace in this shoe and I have thoroughly enjoyed training in my pair. While the GOmeb Razor is a firmer and more cushioned lightweight trainer, the GOrun 5 is the more cushioned racer of the group of three (with the Gomeb Speed 4 being the firmest and fastest). The GOrun 5 is consistent with the aggressive move Skechers Performance is making at the moment to release performance oriented shoes. They have been doing this in the past, but with the GOmeb Razor, the current iteration of the GOmeb Speed (4 2016) and the fit/feel of their trainers (Strada and Forza), the GOrun fits appropriately into the high performance specialty running line that Skechers Performance has to offer. 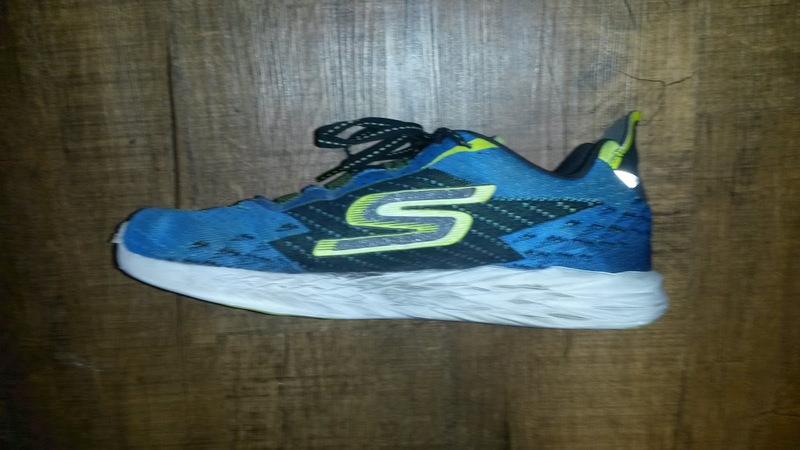 While the upper could use a bit more stability, this is a great shoe that everyone should at least try to see what Skechers Performance now has to offer. These shoes were provided free of charge in exchange for a review. This did not in any way influence or affect my review and views of this shoe. I put at least 75 miles on trainers and 25 miles on racing flats prior to a review. Currently I have 228 miles on my pair of Gorun 5s. A big thank you to Skechers Performance for including me in the development of such cool new series running shoes. Look for them to make some big changes in the Running Specialty market in 2017-2018.